Eric Thomas, Marina General Manager & CEO Sailboat’s Inc.
Messing around in boats has been the life-long activity of Eric. 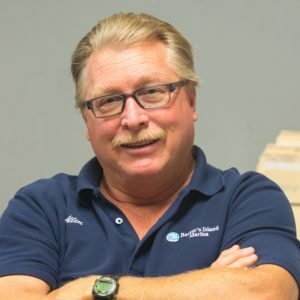 Approaching his twentieth year at Barker’s and in the marine repair industry for over thirty years he has seen just about everything that can and will happen on the waterfront. Eric’s passion is preparing and racing sailboats with his family and alone. Having raced solo to Hawaii and spent weeks cruising with his family of three generations on the same boat, he understands how important ones free time spent on the water can be. 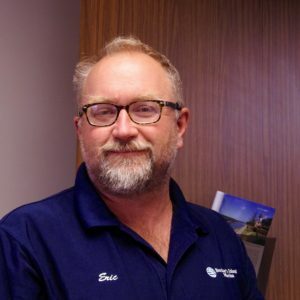 Look for him on the water or in the marina helping clients make decisions on boat priorities and trying to keep the fleet both afloat and functioning well. Eric’s free time is spent with wife Sarah and daughter Téa in the kitchen or on the water. Allen has been playing with boats since he was born. From boating as a lad on Lake St. Clair in anything that would float or running his 38’ fountain T-Top out to fish tuna in the Carolina Gulf Stream, he has been involved in the maritime industry all his life. Plain and simple; he loves and understands boats and their systems. Recruited in 2007 as a project manager here at Barker’s Island Marina, his depth of knowledge is fantastic. We admire his passion for everything he does. 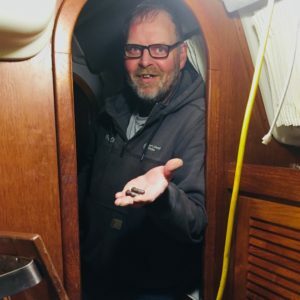 When not managing projects at work, Allen is the Race Committee Chairman for the Duluth Yacht Club and is responsible for a large portion of the racing in the Duluth / Superior area. In his spare time he serves a delegate to the Lake Michigan PEHRF Committee. Occasionally in the winter he will get out ice fishing just to be close to the water. 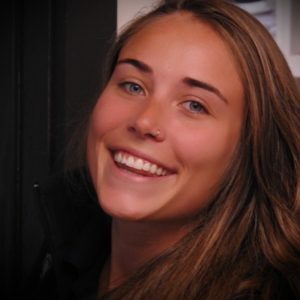 Megan is originally from Washburn, WI where she worked at her first marina in Bayfield, WI and loved the industry. She started working at Barker’s Island Marina as she was going to school at the University of Wisconsin-Superior and has been here since. While at work, she looks forward to working with customers and making their boating experience a great one. In her free time she enjoys camping, hiking, skiing, sailing, beach days, and generally being outside. 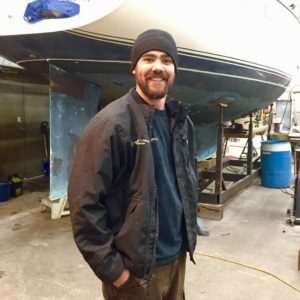 Mike is originally from Orono, MN and began working at Tonka Bay Marina in 2003 during his summers off from Northern Michigan University, and has been full time at Barker’s Island Marina since 2010. He is instrumental in the annual hauling and launching of the boats stored at Barker’s. 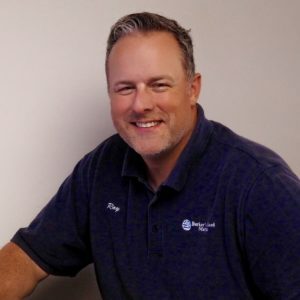 Mike is always kept busy with service projects and has become our leading electronic installer. In his spare time, Mike sails and races Olson’s and Hobie 16’s sailboats in the summer and skis in the winter. He also enjoys camping, hiking, and long walks on the beach. Jason started work at our Knife River location in 2002 and moved to Barker’s Island Marina in 2005. Working his way through the ranks of the boat yard Jason is now one of our senior staff and leads the paint work that the yard has long been known for. Matured into a seasoned top gun Jason tackles our most daunting paint projects. From an entire 55’ sportfish to the carbon fiber rig and bulb keel of a racing sailboat, Jason has painted them all to perfection. 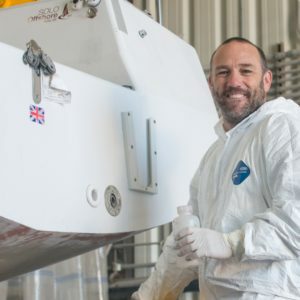 With unique training in Awlgrip topcoats and Sata spray guns Jason is at the top of his game in refinishing boats in our challenging environment. Painting year round, he takes a break from the spray gun and moves to the flame thrower in the fall to Shrink-wrap fifty plus boats every fall in our yard. A life-long outdoorsman, he can be found hunting or fishing every day in some manner. His Maine lobster boat can be seen most evenings and weekends hauling fish from the nearby waters. John started his love for boats when he began racing on a Pearson Ensign with his father when he was 4. Later Competing in offshore races on the great lakes while crewing aboard the Open 60 Trimaran and Trans Superior record holder (28hrs 38 mn) “Earth Voyager”. After touring extensively as a roadie for over 25 years and not being able to resist the pull of the great Gitche Gumee he settled in Duluth. John started at Barker’s Island Marina in 2007 working in the service department, eventually becoming our full time resident Yacht Broker. In his free time, he is the Primary Race Officer (PRO) for the Duluth Yacht Club. He also enjoys sailing the same Pearson Ensign he grew up on with his son. Bruce has worked at Barker’s Island Marina since 2008. An experienced mechanic working with a variety of gas and diesel engines, he is invaluable to the service department. We rely on him to fix anything from service projects to engine work and he does so with ease and accuracy. In his free time he likes to fish, agate hunt, sell items on eBay, and work on his house. Randy started with us in 1982 while a student attending Wisconsin Indianhead Technical College. 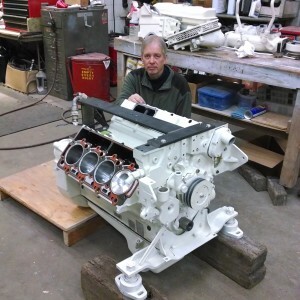 He’s widely recognized as one of the best marine mechanics in the region and has a depth of experience working on a wide range of engines, drives and mechanical systems, from Atomic Four sailboat auxiliary engines to the CAT 3208 diesel he’s pictured with. Randy is certified for Mercruiser, Volvo Penta and Yanmar engines and stern-drives. We value Randy’s mechanical skills and his service approach, which is to not just repair or replace but try to understand, if possible, why something has failed so he can make the most reliable repair. 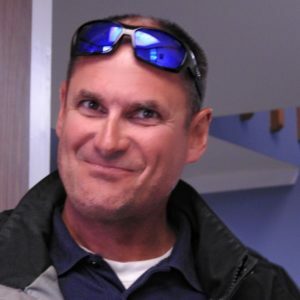 In his free time Randy enjoys being outdoors boating, kayaking, dirt bike riding, hunting, snowmobiling, skiing and more. 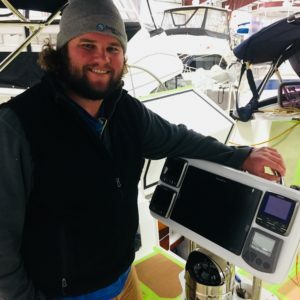 Conner Peterson joined the marina in 2017 with training and certification in modern mechanical systems and engines from Lake Superior College. Living today on his family farm in Northwestern Wisconsin raising a herd of Black Angus cattle, Conner also embraces working outdoors in all the weather conditions that our region enjoys. Farm life mirrors the marina world with changing seasons and lots of chores. Our toughest and strongest employee, Conner throws himself at our most difficult and dirty jobs without hesitation. His innate brain-hand coordination gives him unique skills when working around engines in dark spaces. Conner spends his free time on the farm and volunteering for the Amnicon Township Fire Department. Prior to joining the team at Barker’s Island Marina, Ray spent the last 22 years in the Air Force. Ray was born and raised in Duluth, MN. He joined the Active Duty Air Force right out of High School and served as a Military Police at Eglin AFB, FL. He went on to work at the 148th Fighter Wing, MN Air National Guard as a Financial Management Specialist. Ray’s free time is spent with his wife enjoying the hectic life as parents of three teenage daughters who are involved in sports year round. Before Sterling came to work here he worked in the computer industry for 25 years and owned his own business for 7. He has had a sailboat at Barker’s Island Marina for over 15 years and has been sailing his own boat for 25. 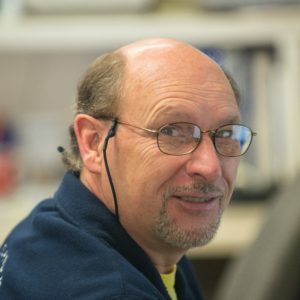 Sterling has worked here for 10 years where he enjoys supporting the technicians, solving complex technical problems, and organizing the areas that he is responsible for. We here at the marina appreciate his vast knowledge of technology and his readiness to fix problems. In his spare time Sterling enjoys cooking, sailing, fly fishing, and hiking. Jason is a cabinet maker and composite construction expert. Prior to joining us here at Barker’s Island Marina, Jason spent time on the Professional Snowboard Circuit and designed and manufactured snowboards. Growing up, he has been surrounded by boatbuilding his entire life. Jason races with DYC on his custom built sport boat. In his free time he can be found spending time on one of his sailboats, or driving one of his classic cars. Steve Worsfold has handled special projects for the marina for many years and came aboard full time in 2014. 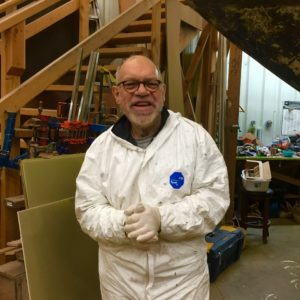 A native of New Zealand, and he apprenticed a boat builder through their excellent training program, Steve can build boats and structures in any medium. While not as popular today, he can still build you and excellent boat out of cement- should you desire. 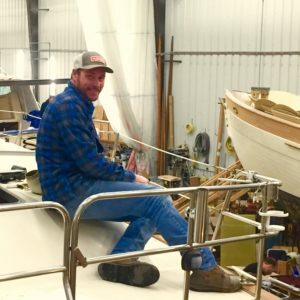 Today he takes care of many of the custom build projects the marina takes on. If an item needs to be designed and created, he can do it. Skilled in design, hardtops and dodgers along with rudders, decks and sprits are all projects he’s done for our clients. A life-long multihull enthusiast, Steve spends all his free time working on his Gemini Catamaran or his son’s custom 44’ cat.